At LMK Clinical Research Consulting we know the toll TMF stress can take on your team and your health. TMF stress damages the fabric of your team, erodes job performance, stokes burnout, and ultimately endangers the health of the TMF. Your TMF brings together thousands of document stakeholders from across the country or the world, all with unique beliefs, goals, and ideas. Therefore, the health of your TMF depends on harmonious working relationships. Beyond addressing resourcing and TMF training concerns, mindfulness-based stress reduction (MBSR) can be an indispensable tool for fighting TMF stress and disharmony. At its core, mindfulness is a state of attention to the present allowing for greater control over one’s emotions, thus strengthening working relationships and improving performance. LMK’s TMF Mindfulness Series gives practical advice, allowing you to incorporate the seven pillars of mindfulness into your TMF processes. Click here to read our first post introducing the series to learn more about the basics of MBSR. In Kabat-Zinn’s pillars of mindfulness, the first pillar of “non-judging” is defined as “not getting caught up in our ideas and opinions, likes and dislikes.” To engage in MSBR, one must create the opportunity for quiet moments in which to calmly and impartially observe your own daily experience. One of the greatest obstacles to witnessing your own experience is the natural tendency to assign value to every observation. Rarely do we take a moment to consider what we are observing before we assign the label of ‘like’ or ‘dislike’ to a stimulus. Like a toddler afraid to try something new on his or her plate, we happily conclude our disgust or enthusiasm without picking up the fork. When applying a non-judging mindset to the TMF, having a non-judgmental mindset towards others is essential. However, this pillar of mindfulness asks us to go deeper than simply striving to be accepting of others: we must also strive to suspend judgment on ourselves and our surroundings. This means, first and foremost, suspending judgment about your past TMF struggles when embracing or beginning a new TMF. This also means removing the lens of your own preconceived notions about the TMF. Judgmental thinking is a staple in a professional and regulated environment where professionals are asked to meet standards and identify trends. Judgmental thinking, though, whether about the TMF or your personal life, should be identified and controlled. Don’t allow snap judgments of your TMF responsibilities or the current condition of your TMF to complicate what should first be observed and understood. Kabat-Zinn assigns “patience: an understanding and acceptance that sometimes things must unfold in their own time”, as the second pillar of mindfulness. As Americans and clinical research professionals, we often judge our value based on our production or ability to get things done. Both professionally and personally, we seek efficiency and focus on milestones of achievement ahead of personal development. When we do try to improve ourselves, we get frustrated with our progress, forgetting that setbacks are inseparable from growth. From this mindset has grown a culture that values ‘busyness’, where what the value of what we are doing takes a backseat to doing anything at all. Just as in achieving health and balance in other aspects of our lives, achieving TMF health takes incremental improvement and is filled with setbacks. Having TMF patience does not mean accepting poor quality or infinitely extending timelines. True mindful patience means recognizing the energetic qualities within yourself and having awareness of how this energy impairs your ability to have compassion for yourself and others. A TMF professional practicing patience recognizes that perfection does not have a fixed definition and is never fully achievable. A TMF team practicing patience recognizes that quality work takes time and communication, and does not allow the creation of unrealistic or unsupported goals that could jeopardize the harmony of the team—and ultimately TMF health. Be sure to watch for our next post on approaching the TMF with a beginner’s mind and trust in your own abilities and intuition. 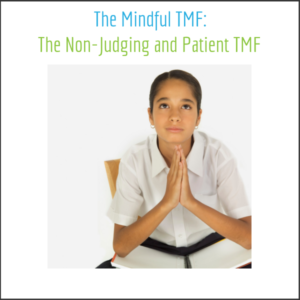 Be sure to watch for our next post in approaching the TMF with a non-judging and patient mindset.